Who doesn't love this colorful, easy-to-grow garden perennial? Purple coneflower is a hardy herbaceous wildflower native to the eastern United States. In early to late summer, it bears tall, sturdy stems topped with single large, red-purple, pink or white daisies with prominent conical centers of brown, orange or green. Bloom time may be extended if spent flowers are removed, or deadheaded. This dependable garden staple self-sows freely but not too aggressively. The seedlings can be highly variable, and those of most cultivars will not grow true to seed. Purple coneflower is happiest when planted in sites with full sun and well-drained moderately fertile garden soil. Germination 1. Place seeds in a plastic baggie with a bit of moist peat moss. Vermiculite is also acceptable. 2. Refrigerate the seeds for one to two weeks. 3. Sow the seeds on the surface of the soil until they begin to germinate. Germination usually takes between 10 and 12 days. 4. Cover germinated seeds with approximately 1/8 inch of soil, spacing them 18 to 24 inches apart. 5. Water the soil regularly and do not let it dry out. 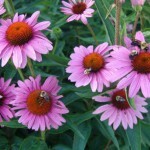 Echinacea blooms from June to October. Plant seeds in the spring time if planting outdoors. Choose an area that gets a lot of sun during the day. Test the pH of the soil before planting. The ideal pH range is between 6 and 8. If you don't have peat moss or vermiculite, you can use moist paper towels. Place the seeds between two towels and then put them in a plastic baggie. Refrigerate and sow as noted in steps 2 through 5 above. If your seeds do not germinate within 20 days, wait a bit longer. 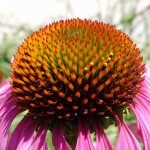 Sometimes echinacea can take up to 6 weeks to germinate.